Leaving, the only thing to do: Act As If. This time of year in times past, I was always edging towards the escape hatch. I would do anything to get out of here for a few days. It’s winter. It’s dreary and cold and dreadful. This meant, in times past, an escape to New Orleans to bask in the relatively balmy late January to early February weather down there: azaleas might be poppin’ up; a magnolia petal might just brush my cheek as I strolled the Garden District; the sky might even be Blue. But these days, there’s just no getting out of here so to remedy this state, so I’m pretending it’s warm by knitting something to wear when it gets warmer and cooking my own creole stew to enjoy. You can see the humungous over-2 lb cone of yarn that is the source for this knit — I wound off some and swatched and VOILA! It’s already getting hotter in here. 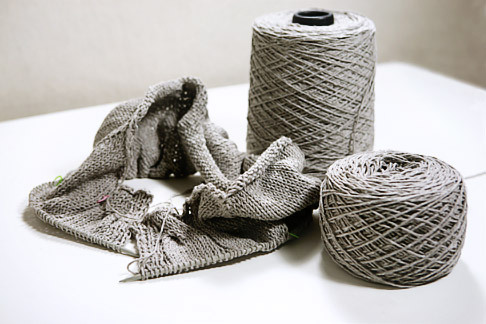 The color is between oatmeal and steel – not really brown or grey – and is something called Naturelle 8/8 (discontinued, 74% Recycled Cotton/24% Acrylic/ 2% Unknown Fibres) from a while back that’s been waiting its turn to become something fabulous. THAT’s the magic of the stash: it just might present a prize to you when you need it most. This outing, my Mondo is going to have cap sleeves and be slightly shorter in length. 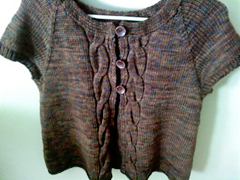 At left you see my inspiration — Sandy’s Mondo Cable cardi. Late last year, Bloomin’ Yarns in PA, (hi Michelle!) had a Mondo KAL and WOW! The lovely ladies made some very beautiful sweaters — have a look here at a few of the models on the Bloomin Yarns’ blog..
Don’t be afraid to modify your projects! If you need buttonholes, make ’em; if loops, and I like this look! are more your style, go for it! Also, you might notice, on the Bloomin Yarns blog, a Mondo made by Kristen, where she continued the collar as Stockinette st with the cables still intact up the edge. Gorgeous! 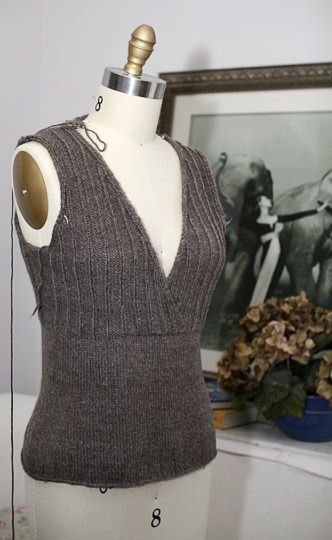 Another great Collar Mod is to just pick up the number of stitches that the pattern calls for and knit it straight up as ribbing, following the ribbing pattern for the bottom hem of the sweater and keeping the left & right front edge finishes intact as you knit the collar. Great Mods: We’ve seen so far, the various widths (3) the original comes with, an I-Cord finish, a medium size ribbed collar, the large collar as above, and just a regular, knit straight up, ribbed neckband. At the grocery store, three clerks knew not its fame (nor cared) when I pleaded with them to find it. As I wandered about, a manager came to find me and showed me with great pride, a jar full of pickled ones, not good for what I was seeking but FABULOUS with Zapp’s Cajun Dill potato chips. I ended up finding these in the freezer section. 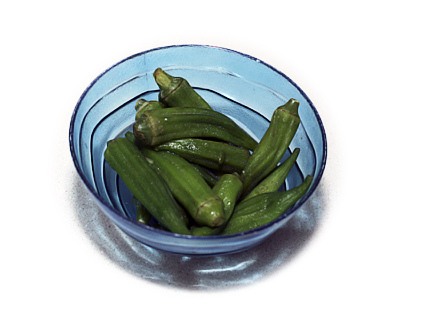 Name this vegetable, neglected and forlorn, scorned by many, loved by me — it cooked down into a fine flavorsome merge with the rest of the pot and added an nice thickening to the stew. TGIF! That’s right. We’re all about the weekend over here at Chez Chic. It’s been a long slog through the M-F this time and we are ready to raise a cheer to a little respite. The weekend beckons and with it a lot of progress — here’s our Aleita ready for action. We love this color — I’ve been calling it Malted Milk but the actual shade is “Milk Chocolate” Shepherd’s Wool by Stonehedge Fiber Mill. We picked it up at Arcadia up on Lawrence a while back — and we wanted every color! This is very beautiful merino, spun in our home state of Michigan, that knits up into a luxuriously soft garment. And that would be: straight to the grand opening of the new downtown Anthropologie store, housed in the very same building that houses ye olde day job! So very exciting (or catastrophic to my wallet) as the case may be!